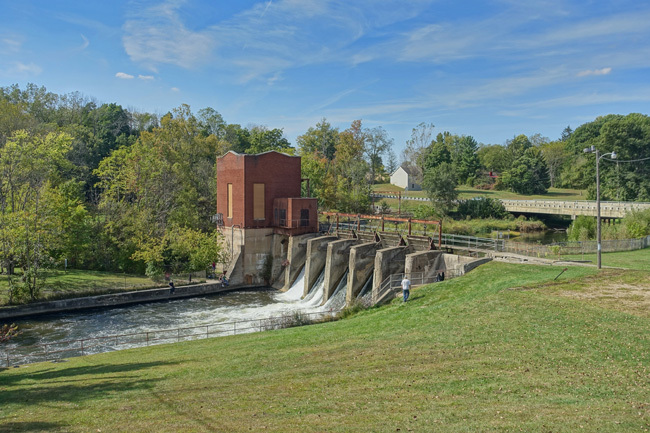 On the outskirts of Niles, Michigan, an aging hydroelectric dam straddles the Dowagiac River. 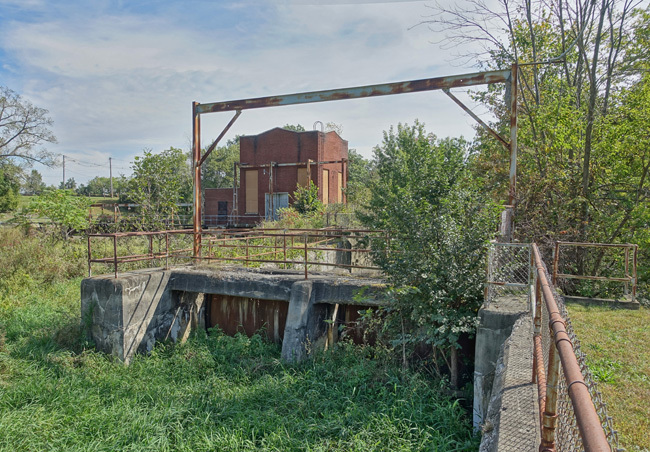 After nearly 70 years of producing electricity for the city, the turbines of Pucker Street Dam ground to a stop. 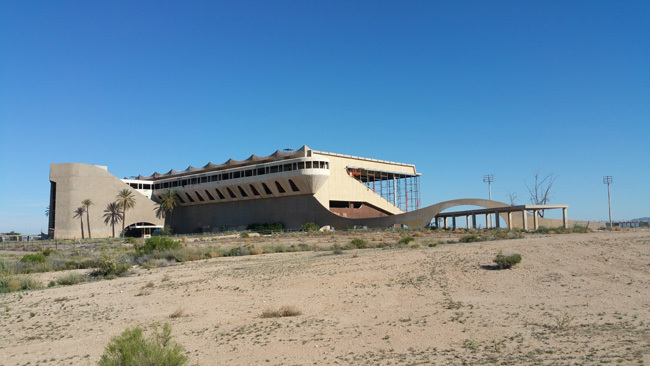 The old structure will soon face demolition. After exploring the incredible ruins of the Kinsgsbury Ordnance Plant, I crossed into Michigan and made my way to the city of Niles. A rural road led me past sprawling farm fields and the lush clumps of forest that hug the banks of the Dowagiac River. 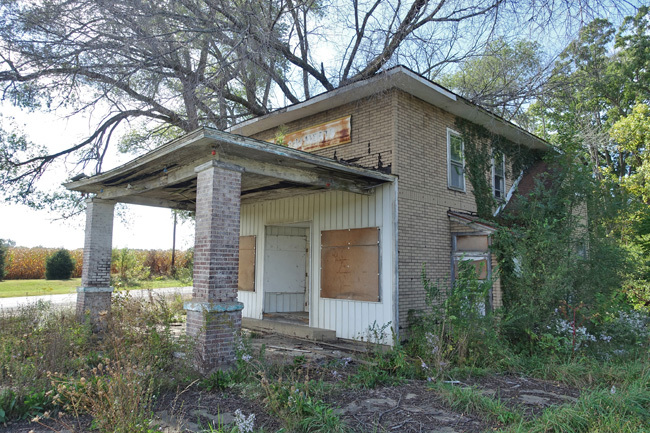 I stopped at a lonely intersection where an isolated two story brick building sat abandoned. Above the sagging porch roof hung a rusty sign with faded lettering that read "Groceries - Cold Meats". Mindful of the "Keep Out" sign on the front door, I kept a respectful distance as I snapped a few shots of the old grocery store. I was not able to find any history on this neat old place. If you have any information, please leave a comment at the end of this article. A few miles down the road, I came to the Pucker Street Dam. A few other cars were parked along the dirt loop that marks the small public park. Half a dozen people sat along the river bank, casting fishing lines near the base of the dam. A popular spot for salmon fishing, I was surprised the sunny weather had not drawn a larger crowd. The sloping green hillside that overlooks the dam is a perfect spot for a picnic. The powerhouse is sealed up and inaccessible so it was not possible to get a look at its inner workings. 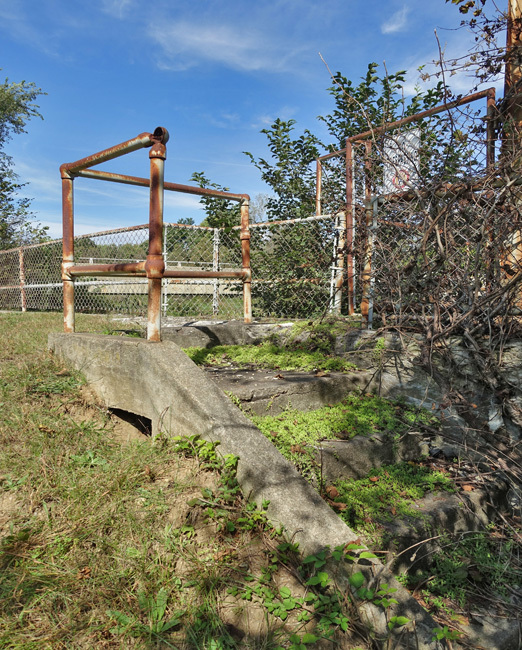 Pucker Street Dam has a long history, extending back almost 200 years. In 1828 a log dam was built at the site to power a grist mill. In 1891 it was converted into a hydroelectric dam. The City of Niles purchased the property three years later. In 1928 the log dam was replaced by the concrete hydroelectric dam, which went on to provide power to the city for 67 years. 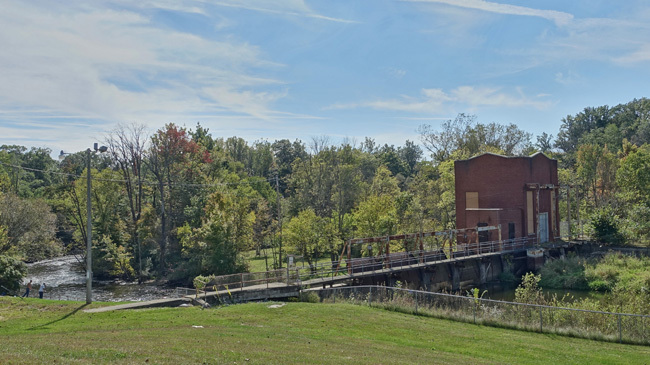 Due to costly maintenance problems Pucker Street Dam stopped producing electricity in 1995. 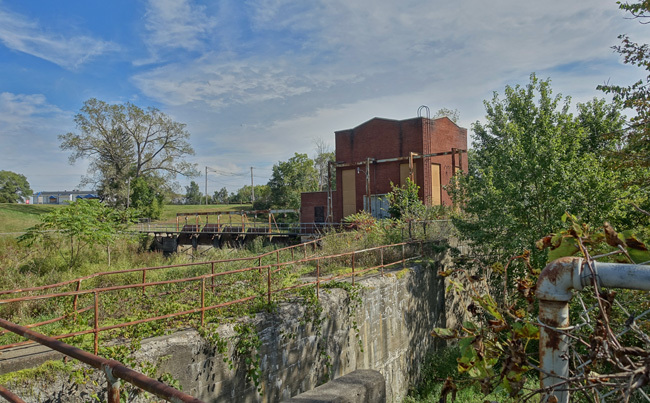 A private company has expressed interest in restoring the dam to working order, but the city remains unconvinced of the economic viability of such a project. 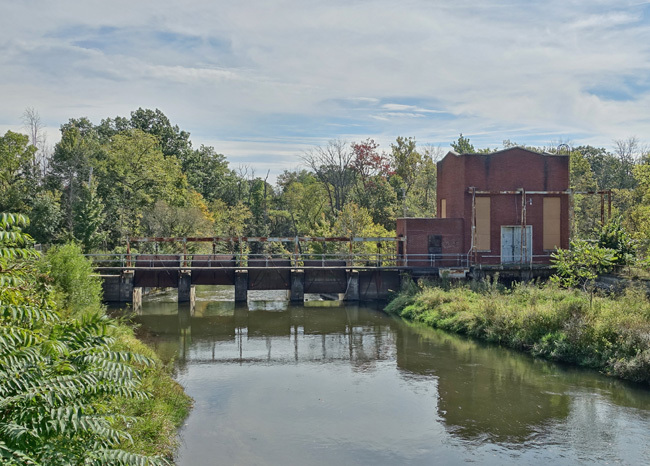 Faced with liability concerns and the increasing cost of maintaining the old structure, the City of Niles has drawn up plans to remove Pucker Street Dam and restore the natural flow of Dowagiac River. Habitat fragmentation is a major factor in the decision. 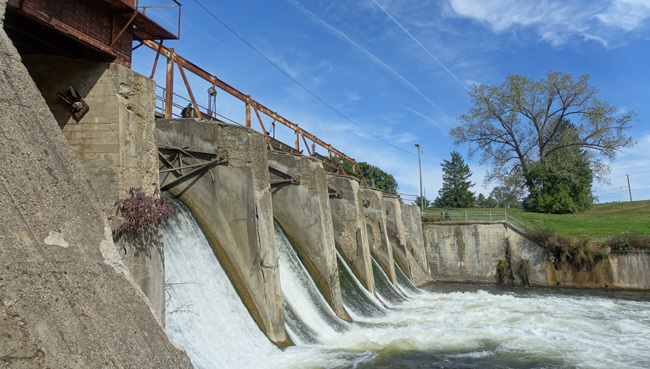 Located about three miles from the intersection of the Dowagiac and St. Joseph Rivers, the Niles dam blocks the migratory route of many species of salmon and other fish, preventing them from populating 159 miles of the watershed. 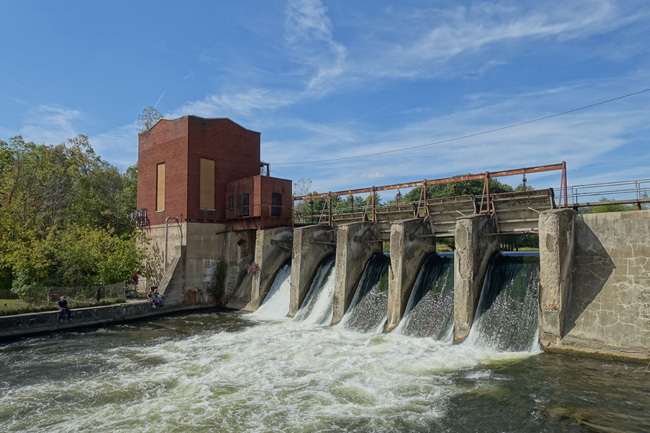 In addition to restoring the ecology of the Dowagiac River system and expanding the fishery, removal of the dam will open the waterway to recreational activities including kayaking, canoeing, and tubing. Grateful for the opportunity to see Pucker Street Dam before it is demolished, I left Niles and continued my journey through the Rust Belt. 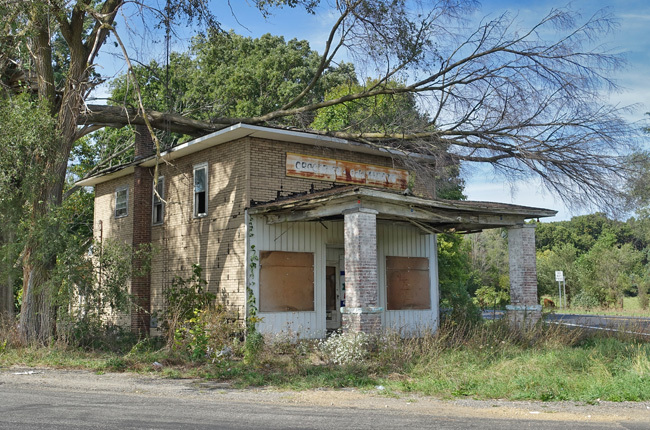 Next stop: Buchanan, Michigan, home of a major abandoned industrial site. Your photography is fantastic! The beauty of the area you have captured with great skill, showing all sides. And your back story, as always, helps explain things, and in this case makes a sound argument for renewal. Great job. station. The mill closed in 1985 and is gone, but someone bought the power plant and to this day sells power to the major utility in this area. The original turbines are still in use. Rumor? Says Edison himself came down to oversee the installation. Amazing that the original turbines are still in use. That is some high quality workmanship. 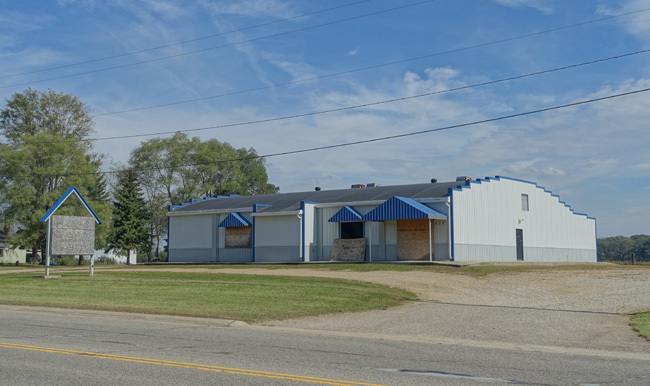 The grocery store was there when I first came to Buchanan, MI, to work for Electro-Voice, in the mid 1960s. I don't recall if it was abandoned then but there was a circa-1947 Cadillac abandoned next to it (at least I recall it looked in too bad a shape to be driven). I was always puzzled by the store's location, pretty much out in the middle of the country. I thought it was a surprising location for a grocery store too. The Cadillac wasn't there at the time of my visit. Hopefully someone is taking good care of it. Where did you go in Buchanan? There is almost nothing left of the old Clark Equipment factory complex (downtown) but the entire Electro-Voice Buchanan headquarters and factory (600 Cecil St) has been totally abandoned since the end of 2003, except for a few years that a caretaker checked on the boiler in the winter time (I don't know when this stopped). I would love to check out the Electro-Voice headquarters. I wasn't aware of it when I was in Buchanan, but I might have to plan another trip back there to see it. My next article will discuss the places I did visit in Buchanan, so I won't spoil the surprise. Look forward to your next adventure - - I find them all very interesting and wish I could still travel well enough to explore some of them. Thank you so much! I'm glad you're enjoying my adventures. I'll be posting more soon. I lived in this area for many years, I drove by the dam countless times on my way to and from my Grandparents lake cottage. It's a beautiful area. I really enjoyed the drive. There's something very peaceful and comforting about seeing so much green. The old building across the street was for many years was the WHITE HOUSE and latter the WHITE HOUSE II. It was a bar that featured live music back in the day. In the 70's it had a sign on the door that indicated that motorcycle colors were not allowed inside, this tells you what kind of place it was. Thanks for the info! Sounds like an interesting place! I wish I could step back in time for a night and stop in for a drink. How sad. I wonder why they're tearing it down after all these years. I grew up living right next to the old Pucker Street dam. I remember on hot summer nights trying to sleep with all the noise from the White House tavern. As a young lad I couldn't imagine why these people were up so late and why all the noise. We used to swim off the bridge just north of the dam. Sometimes a cop would stop on the bridge and tell us there is no swimming allowed from the bridge. We would jump into the water and the cop would drive off. I think he thought it was better we were doing that than a lot of other things. A big day around the river was opening day for Trout season. Youngsters were allowed to stay out all night because season opened at midnight. The area all around the dam was filled with people trying to catch the newly stocked waters. Great place to grow up. I have taken so many pictures here for photography assignments in college. I never found some of the buildings, like the one with the papers you found. Where is that one? Did you find the three story buildings still standing? I wish I could have seen it! I'm just glad I got to see Rolling Acres Mall in Akron, Ohio before it was demolished. One of the most amazing places I've explored.